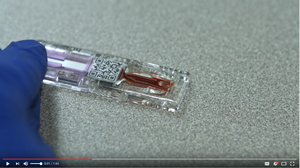 NOWDiagnostics Inc., based in Springdale, Ark., is a leader in innovative diagnostics testing. 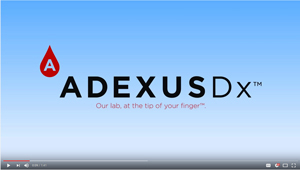 Its ADEXUSDx® product line features a lab at your fingertip, using a single drop of blood to test for a variety of common conditions, illnesses, and diseases with results in a matter of minutes. 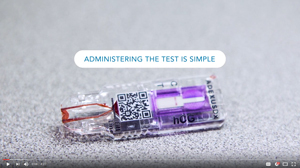 By eliminating the need to send tests to off-site laboratories, NOWDiagnostics has the potential to decrease the waiting period to determine test results by days. The company’s Springdale, Ark., facility was officially registered with the U.S. Food and Drug Administration in December 2014. 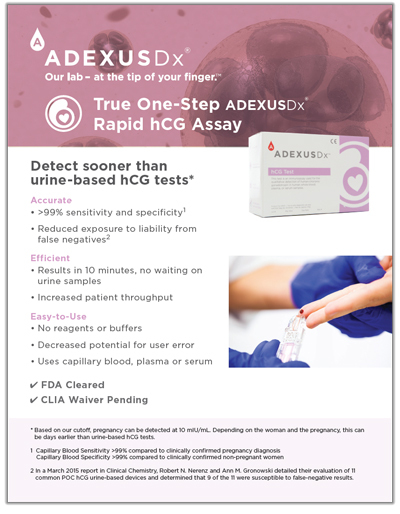 The company is currently offering an hCG (pregnancy) test in the United States and Europe as well as three cardiac (heart attack) tests and three toxicology tests in Europe. Additional tests are in the development pipeline, including sexually transmitted diseases, more cardiac (heart attack), food intolerances, common infectious diseases, and a variety of screening tests. * Based on our cutoff, pregnancy can be detected at 10 mIU/mL. Depending on the woman and the pregnancy, this can be days earlier than urine-based hCG tests.